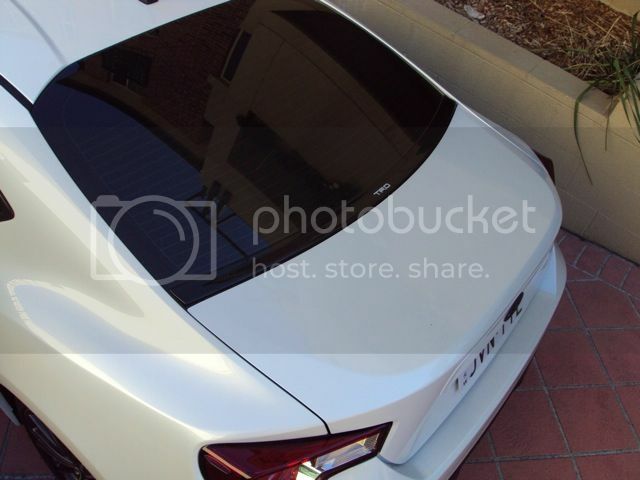 Pictures of TRD Aero Stabilizing Cover??? Hey guys, I know there are pictures on Google, but I was hoping to see some of your own pictures of the TRD stabilizing cover. Here is what it looks like. Does anyone on here have this? Visit my build thread here. Hmm, the pictures don't work for me. Do they work for you? They work fine for me. It's hosted on photobucket. Ok, I see it now. For some reason it won't work on my phone. What are your impressions of the piece? Is it good quality? How is the fitment? I worry about it being only held on by tape. Has it stayed in place over time? Would you buy it again if you had the option? just buy it already and get it over with. It's made by trd. It's good to go. Just follow the instructions. Nothing wrong with getting a little feedback from someone who already owns the piece. I hate you for showing me this useless part, that I now must have. I installed this part but it started rubbing on the trunk after a couple months so I took it off. It didn't rub at all when I first installed it and made sure it was centered. Maybe it's because I didn't use any of the black spacers it comes with. It even came with primer and rubbing alcohol...no idea what those were for. I'm guessing the alcohol was for the window gasket that the cover attaches to. Any dirt or grime would prevent it from sticking fully. I'm worried about the durability of the tape over time. I live in California and garage my car though, so it's not like it will be seeing extreme weather. I wonder if anyone else has an issue with it rubbing like yours? The part is great. Fitment is OEM quality as you can expect from TRD. Just follow the instructions and use the cleaner before you stick it on. It has stayed in place since. I usually park in our area which are surrounded by trees. Without the cover, leaves and other crap get into the sides of the trunk area. Since I put it on, my inner trunk area never gets dirty. Yes I would buy it again. The black foam spacers are centering tools to get the fitment spot on when the trunk is open and closed. If you just eyeball it, you may get the fitment off.